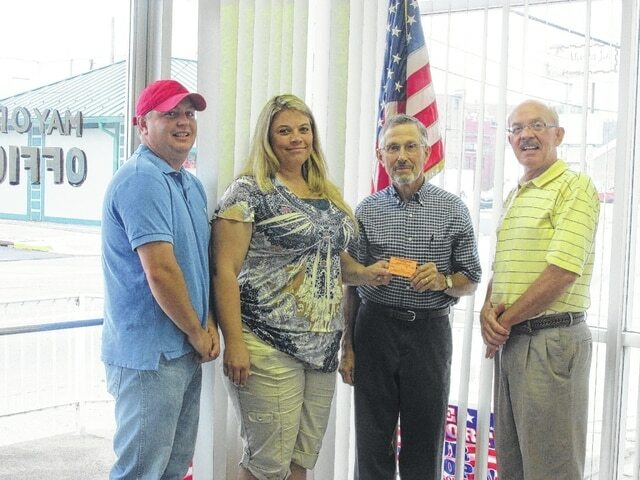 Raymond Yauger of Yauger Farm Supply, pictured third from left, is the purchaser of the first 2015 Mason County Fair Season Pass. Also pictured are Mason County Fair Board Member Joe Arrington, Fair Treasurer Nickki Hunt and Fair Vice President Brian Billings. POINT PLEASANT — West Virginia’s largest county fair, the Mason County Fair, is less than a month away. This year’s fair is Aug. 10-15 at the fairgrounds north of Point Pleasant. The fair has booked some major performers on its main stage, including Nashville stars the Swon Brothers, Mark Wills and country legend Gene Watson. For those who are more rock-and-roll than country, the fair welcomes Crush, a Bon Jovi tribute band. As always, the fair will also host gospel night with headliner Ricky Atkinson and Compassion. The fair unofficially gets started Saturday, Aug. 8 with the annual Mason County Fair Parade, which starts at noon at the corner of Second and Main streets and ends at the Mason County Board of Education Office at 11th Street. Interested parade participants may call Brian Billings at 304-675-6633 or 304-675-5989, Teddy Thomas at 304-675-1034 or the Mason County Fair Office at 304-675-5463. Monday, Aug. 10 – 9 a.m., fair opens; 10:30 a.m., youth 4-H horse show; noon, balloon sandwich; 4:45 p.m., Jason Eades Memorial Scholarship Award; 5 p.m., market hog showmanship followed by market hog show, Little Mister and Little Miss Mason County on the main stage; 7 p.m., garden tractor pull; 7:45 p.m., fair dedication; 8 p.m., Mason County Fair Queen Contest on main stage, includes Annette Hanes Award and Brandy Barkey Sweeney Community Service Award; 9:30 p.m., greasy pig; 11 p.m., gates close. Tuesday, Aug. 11 – 9 a.m., fair opens; 9:15 a.m., kid kids show; 11 a.m., market meat goat show/junior dairy/open goat show; noon, egg toss; 1 p.m., CEOS Demonstration on stage in junior building; 4 p.m., Bo Rickard Youth in Gospel Sing on main stage; 5:30 p.m., Harry Rhodes Gospel Sing on main stage; 5:45 p.m., Point Pleasant High School Black Knight Band performs on inside stage, 4-H scholarship awards; 6 p.m., antique tractor pull, market lamb show and special lamb show; 8 p.m., Gospel Showcase Spotlight on main stage; 9 p.m., Ricky Atkinson and Compassion performs on the main stage, banana eating contest; 11 p.m., gates close. Wednesday, Aug. 12 – 9 a.m., fair opens; 10 a.m., treasure hunt; noon, hay bale toss; 1 p.m., pie eating contest; 3 p.m., replacement heifer show; 5:30 p.m., Wahama High School White Falcon Band performs on inside stage; 6 p.m., commercial feeder calf show; 7 p.m., 4-H Leader Memorial Award in the junior building, demolition derby, riding lawnmower derby and power wheels; 9 p.m., Crush, a Bon Jovi tribute band, performs on the main stage, potato sack race; 11 p.m., gates close. Thursday, Aug. 13 – 9 a.m., fair opens, pet parade in the show ring; 9:50 a.m., youngun’s calf show; 10 a.m., open beef cattle show, junior beef show immediately following; noon, paper airplane toss on inside stage; 2 p.m., seed spitting in outside show ring, Mason County Special Needs Goat Show; 4 p.m., market steer show; 5 p.m., John McCausland Award, Hannan High School Band performs on inside stage; 6 p.m., pretty baby contest, Terry Lynn Williamson Memorial Award, junior and open dairy show; 7 p.m., farm stock tractor pull and diesel truck; 8 p.m. toilet paper toss; 9 p.m, Gene Watson performs on the main stage; 11 p.m, gates close. Friday, Aug. 14 – 7:30 a.m., gates open; 8 a.m., master market showmanship; 10:30 a.m., 4-H Exhibitor, Harold Ridenour Memorial and Donnie Hill Award; 11 a.m., Fair Scholarship Award from Peoples Bank, Mason County Born and Raised Awards from Ohio Valley Bank, Junior Livestock Sale starting with market goats, hogs, feeder calves, replacement heifers, steers, special lambs, market lambs; 5 p.m., Point Pleasant Junior High School Band performs on inside stage; 7 p.m., super stock trucks/tractors/modified stock trucks; 9 p.m., Mark Wills performs on main stage, chicken catch (after the animal show); 11 p.m., gates close. Saturday, Aug. 15 – 9 a.m., fair opens, Open Mason County Youth Horse Fun Show, junior horse show trail class; 11 a.m., dash for cash; 1 p.m., horseshoe pitching, auction for kids games; 2 p.m., pedal tractor pull; 4 p.m., 4-H member dance in the junior building; 4:45 p.m., Robert Lutton Award and Joey Arrington Award; 5 p.m., open horse show, old timers showmanship, motorcycle/ATV motocross; 8:45 p.m., sweepstakes award and Donnie Hill Award; 9 p.m., Swon Brothers perform on main stage. This week the fair’s first season pass was sold to Raymond Yauger, of Yauger Farm Supply, in Southside. The passes, which are $25, can be purchased from fair board members and a number of businesses, including, BB&T, Bob’s Market, City National Bank of Mason, New Haven and Point Pleasant, WVU Extension Office, Farmers Bank of Point Pleasant and Mason, Foodland, Fruth Pharmacy, Health Aid Pharmacy, Ohio Valley Bank, Peoples Bank on Main St. and North Branch in Point Pleasant, Southern States, Extra, Tobacco King, Thompson Hardware, Yauger Farm Supply.